This is the last slice of my husband's birthday cake. It is his favorite so of course I make it for his birthday every year. It is really my Heirloom Cake in disguise. (Ha!) I substitute unsweetened coconut milk for the regular milk. Instead of the portsmouth frosting I use a cream cheese version. 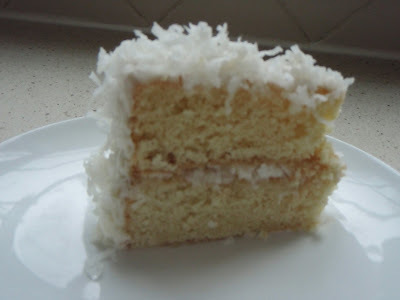 Once the cake is frosted I add unsweetened coconut-just press it lightly onto the sides and sprinkle over middle and top. You could also just frost and fill with whipped cream...fold in some of the unsweetened coconut and you are all set! Mix cream cheese and butter in a large bowl by hand with a spatula or wooden spoon. OR use a mixer. Add the confectioner's sugar and mix until creamy and spreadable.